August 13... it's international left-handers day! August 13 is designated International Lefthanders Day by Lefthanders International. It was first observed 13 August 1976. As its name suggests, it is meant to promote awareness of the inconveniences facing left-handers in a predominantly right-handed world. It celebrates their uniqueness and difference. - stuttering and dyslexia occur more often in left-handers (particularly if they are forced to change their writing hand as a child, like King of England George VI). Feel free to share more curious facts!! 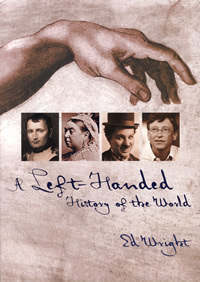 Re: August 13... it's international left-handers day! It was also Friday, 13. Wasn't it? Caprie wrote: It was also Friday, 13. Wasn't it? Fridday the 13th? Or just coincidence....? Though, maybe you are refering to the fact that in certain cultures left handedness is still recognized as an inferior 'quality'... but historical developments around the words have indicated that is likely just a (social) judgement. Let's ask the current US president! By the way, studies have indicated 'lefties' are more seen among artists, and especially in the fields of: science, politics & sports (just to mention a few). Alexander the Great, Julius Caesar, Leonardo DaVinci, Mahatma Gandhi, etc. etc. Probably just a coincidence, if not than with a ironic connotation. Especially when you read that in the past people were blamed for practicing witchcraft and in touch with devil just because they were left handed.